See requirements for UC San Diego researchers working with ethidium bromide. Ethidium bromide (C21H20BrN3) is a potent mutagen used as a nucleic acid stain. Ethidium bromide requires extra precautions during use and disposal because of its highly toxic and mutagenic properties. 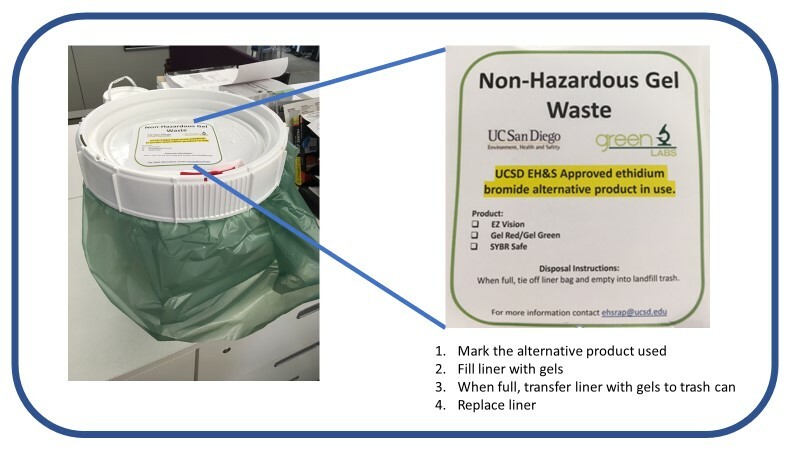 UC San Diego researchers working with ethidium bromide must complete the Acutely Toxic hazard control plan (HCP) obtained through the Hazard Control Plan Application (HCP). Never work alone when working with hazardous chemicals. EH&S has determined that the alternatives listed below do not require management as a hazardous waste. The products are available in Marketplace. Waste Management: Gels used with alternatives must be clearly labeled as non-hazardous. The setup shown below should be used. All materials are available by contacting ehsrap@ucsd.edu. Obtain approval before beginning work. Get approval from your principal investigator before beginning a project involving ethidium bromide. Evaluate the hazards before beginning work. In powder form, ethidium bromide is an irritant to the upper respiratory tract, eyes, and skin. Ethidium bromide is strongly mutagenic, causing living cell mutations. Even though there is no evidence at this time of human carcinogenicity or teratogenicity, this material should be considered a possible carcinogen or teratogen. If possible, use a less dangerous product that can perform the same task. New fluorescent dyes have been developed that manufacturers, such as Molecular Probes Inc. and FMC Corporation, claim are less toxic and have greater detection sensitivity than ethidium bromide. Ethidium bromide spills are very serious and require immediate cleanup. Some facilities use a hand-held ultraviolet (UV) lamp to check for residual ethidium bromide contamination following spill cleanup. A reddish-orange fluorescence can be detected under both "long" and "short" UV wavelengths. Use of a handheld UV lamp to detect traces of ethidium bromide may serve as an occasional check of laboratory practices, but it cannot substitute for good cleanliness and careful contamination control. The ability of hand-held UV lamps to detect small spills is not guaranteed.